There’s nothing more American than apple pie—or its boozy cousin, apple cider. Thanks in large part to some enterprising apple farmers, hard cider is making a comeback, but it’s not the cloyingly sweet mass-market beverage you might recall from your college days. Call it a fruity offshoot of the modern craft beer movement: hard cider is going back to its roots. “People are misinformed about hard cider and don’t know exactly what it is,” said Jolie Devoto of Devoto Gardens. “A lot of people expect it to be some sweet, fizzy beverage, when in fact there are many different styles of cider.” At the recent EcoFarm Conference in Pacific Grove, she shared the stage with another long-time Ferry Plaza farmer, Tim Bates of the Apple Farm, in a panel discussion on the American renaissance of cider making. Today, commercially produced hard ciders are a pale imitation of what our founding fathers drank, as they are generally made with apple concentrate imported from China, the world’s largest apple producer. 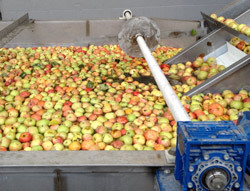 Conventional cider makers might also add sugar to boost the alcohol content during fermentation, a controversial technique (known as chaptalization) borrowed from winemaking. While hard cider only makes up about 1 percent of the beer market, it may be the next frontier in artisanal brews. Cider sales jumped 75 percent last year, and San Francisco opened its first bar dedicated to the pomaceous beverage. At the Apple Farm in Philo, a couple hours north of San Francisco, Tim Bates has been making hard cider the old-fashioned way for more than 25 years, before it was in vogue. Since Tim and his wife, Karen, acquired the orchard in 1984, they have grown heirloom apples and expanded their operation with value-added apple products like juice, chutney, syrup, and vinegar—“what you do when cider goes bad,” according to Tim. Tim admits that when he started growing apples, he wasn’t a big fruit eater, but he was interested in making his own alcohol, a process that took some trial and error. He first experimented with champagne yeast, then lager yeast, but he found that the natural apple flavors didn’t translate in the fermentation process. He then discovered a French method of natural fermentation, which involves leaving the cider out for several days to spontaneously attract wild yeasts, a process that helped preserve the natural apple flavors. His current blend is about 50 percent Golden Delicious, 25 percent Pippin, and 25 percent whatever is coming off his trees, which could be Roxbury Russet, Arkansas Black, Ashmead’s Kernal, Wickson, or any other number of heirloom varieties (all certified organic), depending on the time of year. This means that every batch is a little different, but it’s always a dry, sparkling brew with about 7 percent alcohol content. Inspired by their trips to the cider-making parts of northern Spain, Jolie and Hunter’s debut brew is a single-varietal cider made with Gravenstein apples, an homage to a beloved but disappearing variety that recalls Sonoma County’s agricultural history as a top apple-producing region. In the last century, thousands of acres of apple orchards—many of them heirloom varieties—have been torn out to make way for a growing wine industry. Jolie calls the vintage “a cider to save the Gravenstein,” with the hope that it will raise awareness of this local treasure. “Ciders are made in the orchard,” Jolie continued, referring to the sense of terroir that is the hallmark of a true farmstead cider. 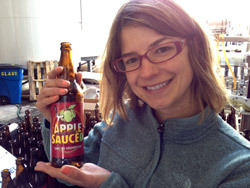 Both Tim and Jolie and have found that educating shoppers and retailers about the differences between mass-produced and artisanal hard cider has been the biggest hurdle in growing the market. 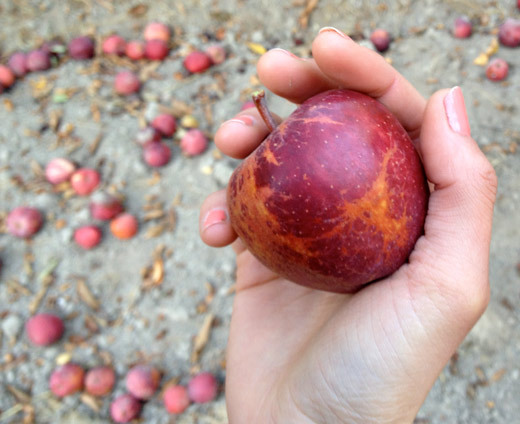 “The variety of apples is just as diverse as wine grape varieties,” said Jolie. The flavors can be as nuanced as wines as well, with fermentation styles inspired by diverse cider-making traditions, and complex profiles ranging from crisp and clean to tannic and bittersweet. And like wine, craft ciders are food-friendly. “People are intimidated by the size of the bottle sometimes,” said Tim, who sells his cider in 750 ml champagne bottles (recovered rejects from a local champagne maker). But if you don’t think you can polish off a bottle by yourself, he encourages you to cook with it or, better yet, share it with a friend over a home-cooked meal. 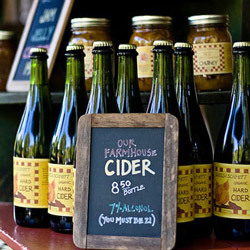 You can find Apple Farm’s and Devoto Gardens’ hard ciders at the Ferry Plaza Farmers Market on Saturdays. Photos courtesy of Apple Farm and Devoto Gardens.